Scheduling interviews is naturally invasive to our schedules. Add 70 to 80 applicants, plus interviewers’ schedules to align, and you have a major disruption to workflow. Every year, the University of Wisconsin Law School (UW Law) ran into this exact issue. With only 10 to 15 open positions, the high number of applicants was quickly derailing their hiring process. They realized scheduling interviews and finding the time to make educated decisions was nearly impossible. So they sought a more time efficient means of screening candidates. UW Law quickly streamlined their process by switching to a collaborative and flexible video interviewing platform. The UW Law & Entrepreneurship Clinic hires entry-level student attorneys for one hiring cycle a year. The clinic provides high quality legal services to entrepreneurs and startup companies in Wisconsin at no cost. Providing legal services to entrepreneurs and startups is serious business. So UW Law has no time to waste identifying qualified candidates during the initial screening process. However, when short on time, narrowing down a high number of candidates quickly leaves many red flags undetected. This is especially true when reviewing resumes. In fact, according to a recent CareerArc report, 72 percent of hiring managers spend less than 15 minutes looking at an application. Unfortunately, phone interviews are just as problematic. 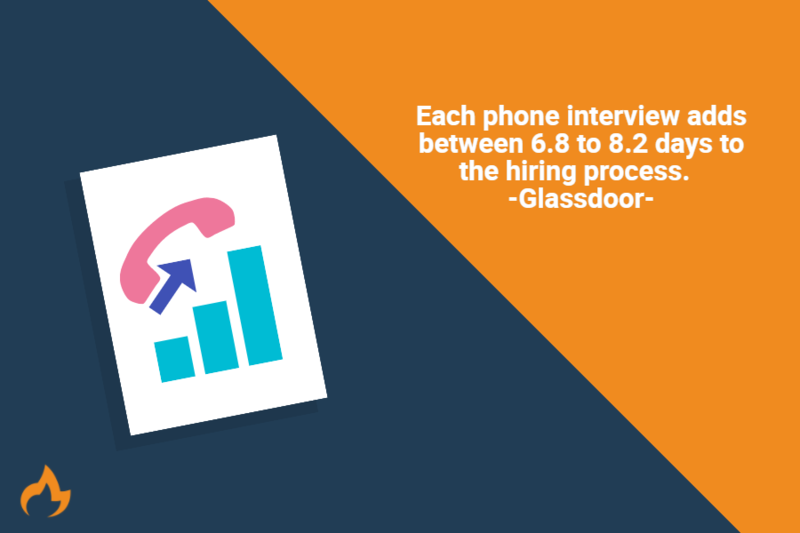 While they seem more convenient than a face-to-face screening, a June 2015 Glassdoor report found each phone interview adds between 6.8 to 8.2 days to the hiring process. Interviewers do not gain a complete picture of candidates’ personalities or skills by glancing at resumes or brief phone calls. A July 2015 report by Korn Ferry revealed only 23 percent of HR pros think phone screens are the best way to interview candidates before a face-to-face interview. The UW Law & Entrepreneurship Clinic found replacing phone interviews with video interviews was undeniably their best option. Video quickly increased their ability to effectively screen all candidates and only pursue the ones who were truly qualified to move on to the next step in the hiring process. Bonus tip: Use video interviews to give yourself a chance to see each candidate and compare how they all respond to the same set of questions. This provides a more in depth look at each candidate’s unique traits and how they’d fit in with the university’s culture. As an interviewer, you know how grueling scheduling interviews is from the company’s standpoint. But quality talent isn’t sitting at home anxiously awaiting your phone call. In fact, an August 2016 Robert Half study found 46 percent of job seekers say they lose interest in a role if they haven’t heard back from a company within one to two weeks. It isn’t just candidates’ impatience and boredom getting in your way of hiring the best talent. MRI Network’s recent study reported 39 percent of employers and 47 percent of recruiters say when their job offer is rejected it’s because the candidate has already accepted another offer. You’ve been battling the war for talent for some time now. This means you know in the competitive world of recruiting, being the slow and steady tortoise will not help you win the top talent race. Unfortunately, much of this feels out of your control. Aligning so many busy schedules will never be an easy task. And in the meantime, candidates are quickly losing interest. Or worse, going to work for another university. By using an automated scheduling tool, you avoid scheduling conflicts that hold up the screening process. Sending out invitations to complete one-way video interviews saves valuable time in the initial stages of hiring. Bonus tip: Keep in constant communication with candidates. Even if there’s a delay in scheduling interviews, don’t leave them in the dark. This will show them you’re interested in them and keeps them on their toes and excited about your opportunity. Each time you get an email about a scheduling conflict, you can see money flying out the window. The longer it takes to schedule interviews — no matter what format — the more resources and employee time is wasted. This results in even higher costs than anticipated. Universities waste more resources by advancing a candidate who turns out to be a bad fit. For example, imagine flying candidates out to interview and realizing a major red flag was missed during an earlier screening process. That cost simply cannot be recovered. Scheduling video interviews as an early screening helps avoid these frustrating and expensive oversights in the hiring process. Each person on your hiring team is able to easily review and offer their opinions on each candidate. This leads to better informed collaborative hiring decisions. Bonus tip: Technology is useful, but only if you find what’s right for you. Never assume interviewing technology will save you time and money. Do your research first to ensure everything from the ATS to the interviewing platform you use is the most effective for your needs. Everyone has different times of day when they are most alert and productive. Expecting each person on your team to work efficiently at the same time is not only unreasonable, but also could end up hurting your interview process. For example, one member of the team might have skipped breakfast and is thinking more about their stomach than the applicant. Another may have rushed to drop their child off early at daycare to make the meeting, and their mind isn’t fully present. No matter what situations your team is dealing with, they can all lead to hiring mistakes. Take a page from UW Law’s experience to prevent these missteps. Because there are often three to six people involved with their hiring decisions, UW Law found it beneficial to share video interviews with team members, rather than scheduling group meetings. Each decision maker is able to communicate and collaborate on their own time, reviewing the interview when they’re feeling the most focused. Bonus tip: Allowing your team to be more hands-on in the hiring process is only possible if they can review when, where, and how they want. Make sure your video interview tool is mobile. This gives everyone the opportunity to review candidates when they have a free moment to give the candidate their full attention. As an institute for higher education, no matter what position you’re hiring for, it’s crucial to making the entire system run smoothly. 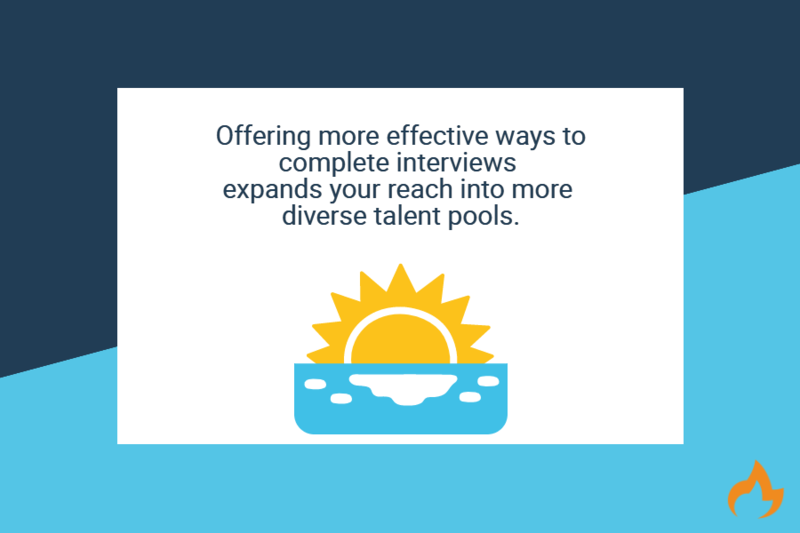 Each moment spent scheduling interviews and finding the best candidates is valuable. If each interview lasts an hour and you can only spend four hours a day interviewing candidates, it limits the number of candidates you can offer interviews to for each position. Especially when schedules are hard to align. Offer alternative forms of interviews to increase the number of initial qualified applicants you can screen. This also keeps your interview process from being biased against certain demographics that have more scheduling conflicts, eg. working parents or passive candidates. Bonus tip: Divide and conquer. If you have a large number of initial applicants, have each member of the team review a portion. Then the favorites can move on to the next step. This ensures everyone gets the time and consideration they deserve. Scheduling interviews isn’t just stressful on employers and recruiters. In fact, the previously mentioned Robert Half report found 33 percent of job seekers said scheduling delays were the most annoying part of the hiring process. When you eliminate those delays, you improve your candidate experience, which has big impacts for future hiring. A 2016 Talent Board report found of candidates who rated their experience a five out of five, almost all would reapply with the company. Conversely, 41 percent of candidates who rated their experience a one said they would definitely be cutting all ties with the organization — even as a customer. When you combine the stress of aligning schedules with the immense pressure of interviews, candidates become overwhelmed, resulting in a negative candidate experience. Having a more streamlined interview process starts relationships with potential candidates off on the right foot. The best place to start working relationships is in the #interview. Also, by eliminating this extra stress, candidates can more freely open up and show their true selves. With video interviews, you can set the number of video takes candidates can record in. Candidates can then take a few rounds to ensure they submit their best self, which results in higher quality answers — and less stressed candidates. Bonus tip: You can only know so much sitting on the recruiting side of the interview table. Always ask for feedback from candidates so you are sure your candidate experience is really as great as you think it is. To really benefit from candidates’ opinions, bring recently hired team members in to get fresh eyes on your hiring process. Most people want to work for higher education institutions that are progressing and moving into the future. If you’re relying on scheduling interviews with old and outdated technology during the interview process, candidates will assume your institution is behind the times in all things related to technology. This could easily make them reconsider you as an employer. Leaving your team short on qualified, forward-thinking candidates. Just like candidates, employers need to put their best foot forward when making first impressions. Offering access to easy-to-use tech tools during the interview process shows candidates you’re up-to-date on technology and value their time. 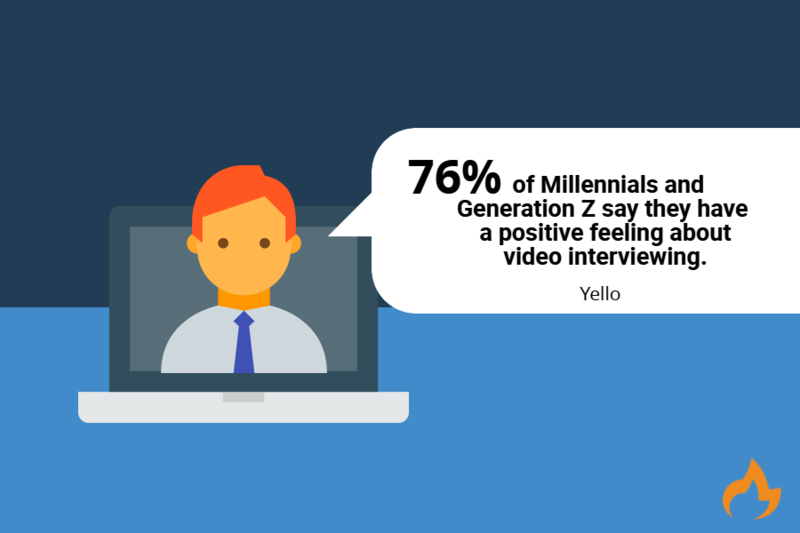 In fact, a 2017 Yello survey looked at millennials and generation Z’s opinions about interviewing technology. Seventy-six percent has a positive feeling about video interviewing. Additionally, nine out of ten said using interview scheduling tools had a positive impact on their decision. Bonus tip: Showcase your use of technology early on by using videos in your recruiting material and in your job descriptions. Candidates will be both intrigued and impressed by your streamlined hiring process. 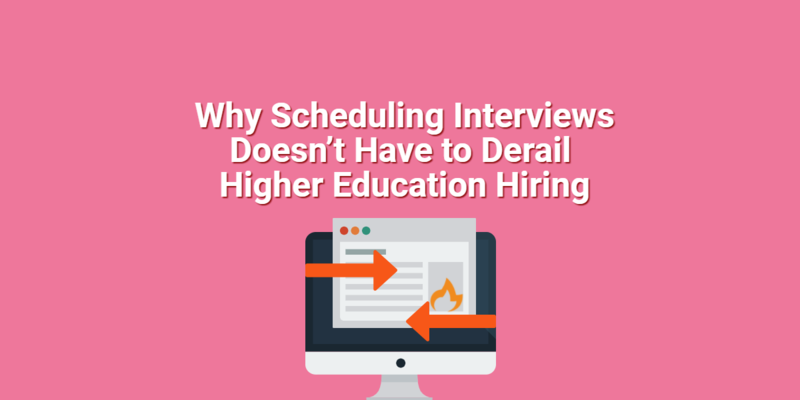 What do you find most difficult when scheduling interviews for higher education? Let us know in the comments below.